Eosinophils are often predominant inflammatory leukocytes infiltrating oral squamous carcinoma (OSC) sites. Prostaglandins are secreted by oral carcinomas and may be involved in eosinophil infiltration. The objective of this study was to determine the factors contributing to eosinophil migration and potential anti-neoplastic effects on OSC. Eosinophil degranulation was evaluated by measuring release of eosinophil peroxidase (EPO). Eosinophil chemotaxis towards OSC cells was assessed using artificial basement membrane. Eosinophil infiltration was prominent within the tissue surrounding the OSC tumor mass. We observed growth inhibition of the OSC cell line, SCC-9, during co-culture with human eosinophils, in vitro, which correlated with EPO activity that possesses growth inhibitory activity. The PGD2 synthase inhibitor, HQL-79, abrogated migration towards SCC-9. Our data suggest that OSC-derived PGD2 may play an important role via CRTH2 (the PGD2 receptor on eosinophils) in eosinophil recruitment and subsequent anti-tumor activity through the action of eosinophil cationic proteins. Eosinophils are bone marrow-derived, tissue-dwelling granulocytes found transiently in the blood circulation en route to tissue inflammatory sites. They are prominent cells in allergic inflammation, asthma and parasitic helminth infections . Tumor associated tissue eosinophilia (TATE) has long been recognized as a pathological feature associated with a number of malignant tumor types, including cancer of the mouth, esophagus, larynx, pharynx, breast, lung, intestine and genitourinary tract . Although mononuclear cells, and to a lesser extent neutrophils, are also found in oral cancers, eosinophils when present, form the predominant inflammatory cell population [3–5]. While there is evidence of a positive prognosis associated with eosinophil infiltration of grade II and III tumours , in well-differentiated oral cancer of grade III and IV, the presence of TATE indicates a poor prognosis . Regardless, data on the prognostic value of TATE in other cancer types remain inconclusive . OSC are known to express cycloxygenase-2 (COX-2) and to generate PGE2[8–11]. In fact, expression of COX-2 and PGE2 was thought to be related the proliferation and invasiveness of OSC [12–15]. PGE2 does not possess chemotactic activity for eosinophils, but share the same precursor, PGH2, with a potent eosinophil chemotactic molecule, PGD2[16–18]. In this study we hypothesized that OSC synthesize and release PGD2 which in turn is responsible for specific chemotaxis of eosinophils towards OSC. Paraffin embedded tissues of the corresponding sections were sectioned at 4 microns. The sections were then deparaffinized and hydrated in distilled water and stained in a Weigert’s iron hematoxylin and Biebrich scarlet solution (9:1). A differentiation step in 1% acid alcohol was then performed on the sections until the eosinophil granules stained bright red, followed by rinsing in tap water. The sections were then stained in a 0.5% lithium carbonate solution until they turned blue. A final rinsing step was performed before the final slide mounting steps. Approval for the study was obtained from the local Ethics Research Board at the Faculty of Medicine and Dentistry (University of Alberta) and all adult subjects gave their informed consent according to the Helsinki protocol. Blood eosinophils from atopic donors were purified as previously described . Briefly, venous blood (100 ml) was collected in tubes with heparin. Red cells were sedimented using Dextran 6% (Sigma-Aldrich Canada Ltd. Oakville, Ontario, Canada). Granulocytes were separated from mononuclear cells by centrifugation on Ficoll Paque. Eosinophils were separated from neutrophils by CD16 immunomagnetic negative selection using a magnetic cell sorter (Miltenyi Biotec GmbH, Bergisch Gladbach, Germany). Purity of eosinophil preparations was always greater than 98%, the contaminating cells being neutrophils and/or lymphocytes. SCC9 (American Type Culture Collection (ATCC), Manassas, Virginia) were seeded at 5 × 104 cells/ml in 12 well plates 24h prior addition of eosinophils at a range of eosinophil-SCC9 concentrations. Plates were cultured until confluence of SCC9 cells was reached in control wells. Eosinophils were then removed and adherent cells were fixed with 4% paraformaldehyde (Sigma-Aldrich Canada Ltd. Oakville, Ontario, Canada) for 20 minutes and stained with crystal violet 1% (Sigma-Aldrich Canada Ltd. Oakville, Ontario, Canada). After a PBS wash, cells were lysed with 15% acetic acid and absorbance (550 nm) was measured. Absorbance was in the linear range for 2 × 102 to 2 × 106 eosinophils/well. The transmigration of eosinophils through the basement membrane components was evaluated in 24-well Biocoat Matrigel Invasion Chambers® (Becton Dickinson, Bedford, MA) as previously described . Before the assay, SCC-9 cells were allowed to grow to confluence in the lower chambers, washed and fresh media replaced before the addition of 0.5 × 106 eosinophils in the upper chamber. PGD2 synthase inhibitor HQL-79 (Cayman Chemical, Ann Arbor, MI.) (0.1-100 μM) was added to lower chambers to block the production of PGD2. HQL-79 is an orally available selective inhibitor of hematopoietic prostaglandin synthase specific with an IC50 of 100 uM for PGD2 but marginally affect the production of other prostanoids [21, 22]. The percentage of transmigration was calculated by dividing the number of cells in the lower chamber of the Matrigel Invasion Chamber® by total number of cells in the lower (migrated) and upper chamber (non-migrated). The proportion of cells recovered was always >95% of the number of added cells and viability always above 98% as determined by annexin V/PI assay (n = 3). Measurement of EPO release has been previously described [19, 23]. Briefly, eosinophil suspensions (5 × 105 cells/ml HBSS + CaCl2 1.6 mM, 0.1% gelatin) were distributed in 96-well plate. Cells were incubated for 30 min at 37°C. Peroxidase substrate solution for the measurement of EPO was prepared by adding 800 μL of 5 mM O-phenylenediamine HCl (OPD) (Sigma-Aldrich Canada Ltd. Oakville, Ontario, Canada) to 4 ml of 1M Tris buffer (pH 8.0) and 1.25 μL of 30% hydrogen peroxide (Sigma). Distilled water was added to a total volume of 10 ml. The OPD solution was added to each well of eosinophils, incubated for 2 minutes before the reaction was stopped with the addition of 4M H2SO4 (Sigma-Aldrich Canada Ltd. Oakville, Ontario, Canada). Each experiment was done in triplicate and absorbance reading at 490 nm wavelength was done for this colorimetric assay (Softmax, 490 nm wavelength). Detection of PGD2 in media after transmigration was achieved using by EAI according to manufacturer instructions (Prostaglandin D2 EIA Kit, Cayman chemical, Ann Arbor, MI). The apoptosis/viability assay was performed using the BD Bioscience Annexin-V-A488 detection kit according to manufacturer instructions. Acquisition was performed using BD FACS-CANTO flow cytometer. Viable cells were double negatives for ToPRO-3 and Annexin-V-A488. Eosinophils were incubated in the presence of anti-CRTH-2-PE (MB16, RatIgG2a, Miltenyi Biotec, Auburn, CA) or matched isotype control antibody. Direct staining was used to detect the presence of specific surface binding with BD FACScanto flow cytometer. All results are expressed as mean ± standard error of mean. Comparison between the groups was made using analysis of variance (ANOVA; Statview 5.0, SAS Institute, Cary, NC). A p-value <0.05 was considered significant. Paraffin embedded oral squamous carcinomas specimens were obtained post-surgically from a cohort of 21 subjects. Evidence of eosinophil infiltration was observed around the tumor mass. Figure 1A depicts a specimen with massive eosinophil infiltration in connective tissue. In contrast, very few eosinophils were detected in the tumour cellular compartment (Figure 1B). TATE is observed predominantly around the tumor mass. A: Luna staining for eosinophils in surgically-resected primary oral squamous cancer. B: higher magnification clearly shows that Infiltration of eosinophils is observed around tumor mass. Arrows indicate tumor mass. To examine the capacity of OSC to elicit eosinophil migration we used a migration system that uses an artificial cell basement membrane (Matrigel™) to separate compartment. Eosinophils did not migrate spontaneously through the lower chamber in the absence of SCC9 cells (7 ± 2%, n = 20). In comparison, the confluent monolayer of SCC9 cells induced migration toward OSC through matrigel (Figure 2, 32 ± 5% n = 17, p < 0.05). To determine whether PGD2 played a role in this migration, a PGD2 synthase inhibitor (HQL-79) was used. Before migration, the OSC monolayer was washed with fresh media to ensure only de novo generation of PGD2 was affected by the HQL-79 inhibitor. A dose response effect of HQL-79 on SCC9 induced eosinophil migration was observed. At a maximal concentration (100 μM) HQL-79 reduced the migration to a level similar to background spontaneous migration (11 ± 7%, n = 9, p < 0.05). The positive control, CCL-11 (eotaxin-1), induced migration at a level of 43 ± 6% (n = 20, p < 0.05). HQL-79 did not impair CCL-11-induced migration or reduced eosinophil viability as determined by flow cytometry (data not shown). The secretion PGD2 was also confirmed by enzyme-linked immunosorbent assay (EIA) in SCC9 confluent wells after transmigration, a mean concentration 1.5 ± 0.4 nM of PGD2 was detected in the 4 experiments tested. The addition of HQL-79 (100 μM) reduced the PGD2 concentration below detection limit. Eosinophil migrates through artificial basal membrane (Matrigel) toward SCC9. 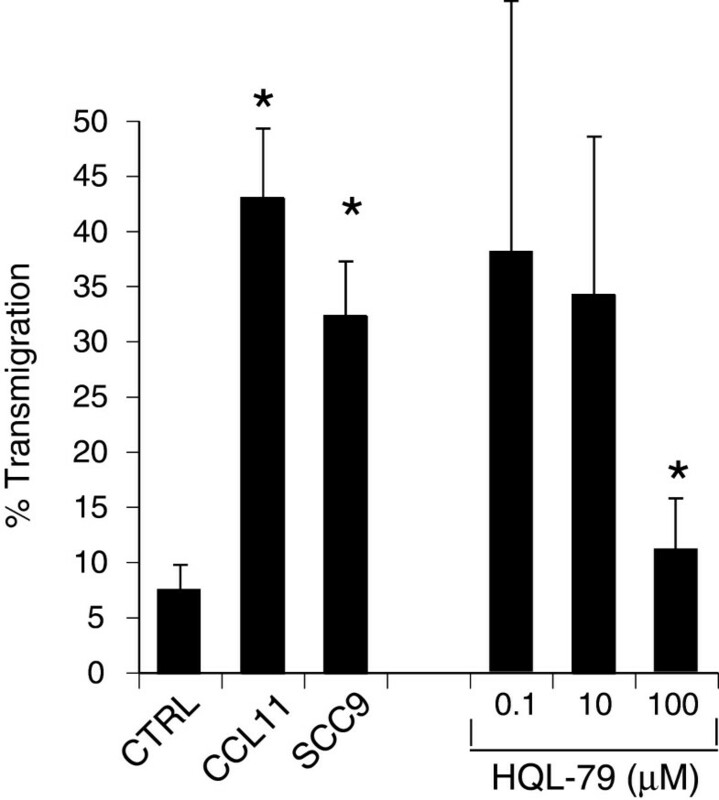 CCL11 (eotaxin 0.01μm) was used as positive control for transmigration assay. PGD2 synthase inhibitor (HQL-79)-treated SCC9 did not induce eosinophil transmigration (n = 9, Mean ± SEM, p < 0.05). Figure 3A shows a representative confluent layer of OSC after 5 days of culture. In contrast, adding eosinophils prevented OSC from reaching confluence (Figure 3B). In an attempt to potentiate eosinophil survival and function and potentially decrease tumor growth, we added IL-2 (100 ng/ml), IL5 or a combination to the culture media. Figure 3C depicts the mean results of 5 independent co-culture assays. Maximum growth inhibition (60 ± 7%, n = 5, p < 0.05) was achieved in co-culture with a 25:1 ratio of eosinophil: SCC9. The growth of OSC was unaffected by treatment with IL-5 alone (10 ng/ml; SCC9 + IL-5). In conditions were SCC9 + IL-5 + eosinophils (25:1) were co-incubated inhibition reached only 18 ± 4% (n =5, p < 0.05). The addition of IL-5 and IL-2 increased SCC9 growth inhibition when co-incubated with eosinophils ratio of 10:1 (25 ± 6%, n = 5) and 25:1 (39 ± 8%, n = 5, p < 0.05). Eosinophils inhibit the formation of monolayers of the oral cancer cell line, SCC9. A: Representative confluent monolayer of SCC9, 5 days after culture, Nuclei are stained with DAPI for easier identification of SCC9 after washing out eosinophils (red bar = 100 μm). 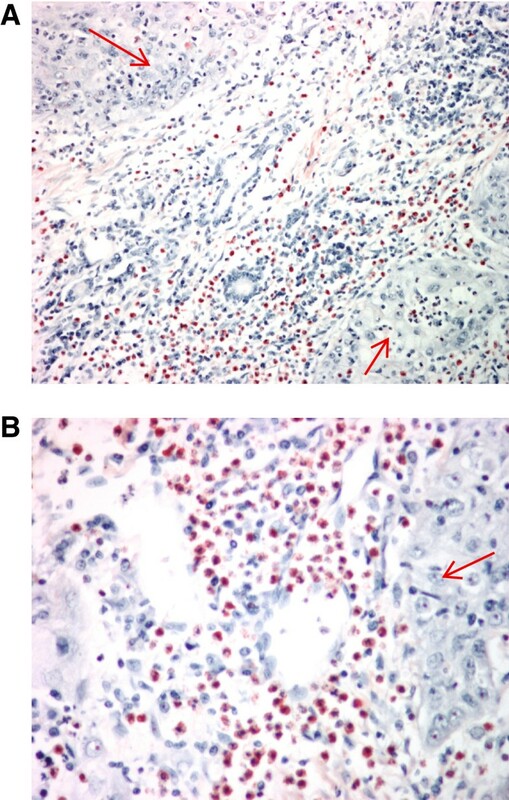 Eosinophils were removed from wells before staining B: Co-culture with eosinophils prevented SCC9 cell growth. ( 25:1 eosinophil-SCC9 ratio in media) C: Mean growth inhibition observed in 5 independent experiments with different eosinophil-SCC9 ratio. IL-5 was used to sustain eosinophil viability except in control group. Reference group (0% growth inhibition) represent SCC9 incubated without addition of cytokines or eosinophils that reached confluence (5 days). 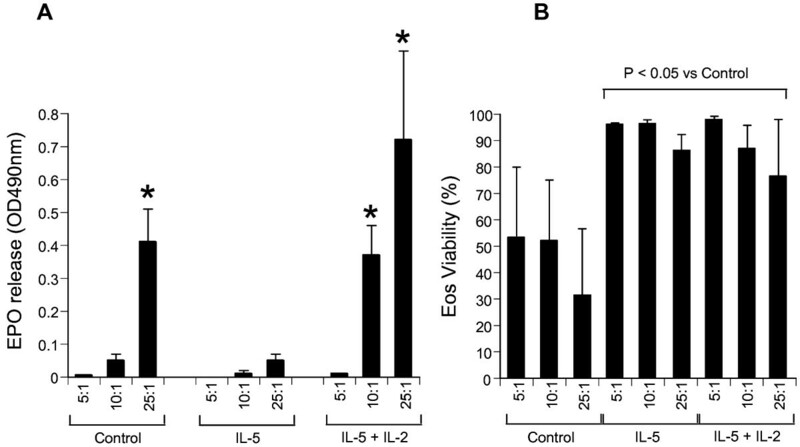 SCC9 + IL-5 and SCC9 + IL-5 + IL-2 represent control groups for the effect of cytokines without eosinophil co-incubation. All data are represented by Mean ± SEM * p < 0.05. Eosinophil peroxidase (EPO) is a potent cytotoxic protein stored by eosinophils. We observed two forms of EPO release: first from necrotic non-IL-5-treated eosinophils and those stimulated by IL-2. In contrast, negligible EPO activity was detected in the supernatant of IL-5 treated co-culture of cells associated with the minimum growth inhibition (Figure 4A). Eosinophils viability in co-culture medium was measured immediately after control OSC reached confluence (after 5 days). Eosinophil viability was reduced under medium alone conditions but remained well above 80% in medium containing IL-5 (Figure 4B). In IL-2 + IL-5-treated groups, eosinophil viability remained unchanged indicating that the EPO activity measured was unlikely to be attributable to necrosis. Since IL-5 alone did not induce significant EPO release or OSC growth inhibition, IL-2 plus IL-5 appeared to induce EPO release without exerting an effect on eosinophil viability thereby contributing to OSC growth inhibition. These results indicated that OSC growth inhibition in untreated medium might be a result of eosinophil necrosis, cell membrane disruption and inevitable toxic mediator release by cytolysis. Maximum EPO activity correlated with maximum growth inhibition. These results suggest that cytotoxic mediator release may be a mechanism by which eosinophil inhibit the growth of OSC. SCC9 growth inhibition correlate with EPO release and cell viability. A: IL-2 induced release of Eosinophil peroxidase (EPO) in culture media is associated with inhibition of oral cancer cell proliferation. EPO was measured by a colorimetric assay using the substrate O-phenylenediamine dihydrochloride. B: Viability of eosinophils in co-culture with oral squamous cancer cells. Viability was measured using flow cytometry by assessing cell integrity using Topro3 DNA dye and absence of apoptosis with Annexin V. All data are represented by Mean ± SEM * p < 0.05 for eosinophil:SCC9 co-culture compared with the respective controls without cytokines. Eosinophil infiltration around tumor nests is a frequent feature of OSC and is accompanied by a mixed lymphocyte response . This infiltration often correlates with deposition of eosinophils cytotoxic proteins with favorable prognosis but the mechanism remains unclear . The de novo secretion of PGD2 by the OSC cell line, SCC-9, the matrigel transmigration experiments, and inhibition with the PGD2 synthase inhibitor, HQL-79, all combine to suggest that PGD2 may be an important mediator in tumor-induced recruitment of eosinophils. Previous studies have reported PGE2 secretion by OSC [15, 25, 26] but there has been no evidence that this prostaglandin exerts chemoattractive activity on eosinophils; however a closely related prostaglandin, PGD2, is known for its chemotactic activity on eosinophils [16–18]. In this study we report that eosinophils exhibit potent growth-inhibitory activity against the oral cancer cell line, SCC9 which was associated with eosinophil specific EPO release in culture medium. There is no evidence to date that cytotoxic eosinophil granule deposition plays a role in vivo and no data so far exist to support a correlation between granule deposition in OSC and favorable prognosis. In our experiments, we observed that inhibition of OSC growth correlated with detectable cytotoxic granule enzyme EPO activity in culture medium. This association between OSC growth inhibition and eosinophil mediator release was observed regardless of eosinophil viability in the absence of factors that sustain viability (IL-5) thus disrupting eosinophil cell membranes resulting in a non-specific cytolytic release of granular content. Immunotherapy using IL-2 has been shown to have moderate success against some tumors and is often associated with “unexpected” but significant eosinophilia , which resulted in assumptions suggesting that eosinophils possess anti-tumor activity, at least in vitro. Indeed, IL-2 is recognized as a potent regulator of eosinophil activation, in vitro[29, 30]. The effects of IL-2 include the release of cytotoxic granules, generation of superoxide radicals [31, 32] and production of autocrine IL-2 [29, 30]. IL-2-induced TATE (corollary to treatment of renal cancer), close proximity of activated eosinophils with bladder tumor cells and the subsequent deposition of eosinophil cationic granules were shown to be associated with a favourable outcome . In contrast, the presence of IL-2-induced eosinophilia was considered predictive of the failure of therapy in renal cancer . Despite the significant in vitro effects we observed with OSC, eosinophils appeared to be mostly recruited around, but not within OSC masses. As well, there was very little evidence of eosinophil granule deposition ex vivo. Regardless, basic proteins from eosinophil granules are extremely cytotoxic, thus, small concentration of free exocytosed granules may be sufficient to exert a potent inflammatory/cytotoxic response against tumor cells . Recent studies from our group suggested that cell-free granules from eosinophils can secrete their content via direct stimulation of functional cytokine and chemokine membrane receptors for present on the granule membrane, in the absence of an intact cell . In addition to these potential cytotoxic effector activities, eosinophils are also capable of exerting an immunoregulatory role in relation to the tumor environment. Eosinophils secrete a wide range of cytokines chemokines and growth factors  and these may further contribute to the biological and immunological role of the eosinophil in OSC. Finally, the cyclooxygenase-2 (COX-2) inhibitor, NS398, was reported to inhibit OSC proliferation by suppressing PGE2 secretion . However, PGE2 is not a chemoattractant for eosinophils. In contrast, we show that PGD2 is a potent chemoattractant for eosinophils, and may contribute to eosinophilic infiltration via its specific PGD2 receptor on eosinophil, CRTH2, which is also a marker of TH-2 subset of helper T-cells . Whether PGD2 also enhances the potential of eosinophils to kill target cells by inducing exocytosis and subsequent deposition of cytotoxic granule proteins remains unknown and is the subject of a separate study. Thus, our data suggest that eosinophils may contribute to the inflammatory response observed in OSC and may limit tumor progression. This work was supported by the Canadian Institutes of Health Research and the Faculty of Medicine and Dentistry; Endodontics Fund/University of Alberta and the Alberta Heritage Foundation for Medical Research. LC is an Alberta Heritage Medical Scholar. At the time of the study, RM was an Alberta Heritage Medical Scientist, and DJA an Alberta Heritage Clinical Investigator. FD wrote the manuscript and was primarily responsible for the acquisition of data, analysis and data interpretation. FD and RM also designed the study. AS, CT, SF, YW and CE were also involved in acquisition of data, analysis and interpretation of data. YW contributed to the design of the EPO assay and collection of data. LP, DY and TMcG contributed to the collection and supervision of the pathological specimen collection and review of the scientific content of the manuscript. LC provided important intellectual input specifically regarding PGD2 and CRTH2 on eosinophil migration, and was also involved in the intellectual aspect of the scientific content of the manuscript. RM, DA and DY were co-supervisors of FD, with RM being the principal investigator for this study from conception, design, analysis, and interpretation to writing of the manuscript and final approval of the submitted and revised version of the ms. All authors read and approved the final manuscript.